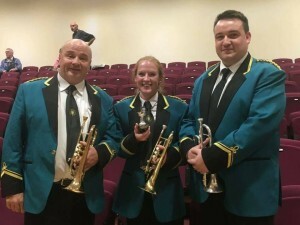 On 30th October, the band competed in Addlestone at the Challenging Brass contest. There was a mixed programme, including ‘Sing, Sing, Sing’, the set march ‘The Mad Major’, the Euphonium Solo ‘Benedictus’, played by solo Euphonium, Paul Miller and a cornet trio ‘Trumpets Wild’, played by Sean Kelly, Jenni Hughes and Matthew Ruel. Overall, the band came a very close second place, but won a prize for the cornet feature. Here’s our players with their trophy! The band also took part in a massed bands performance of The Mad Major, with all the players from all four bands on the stage at once – I’m sure the audience’s ears were ringing with all that powerful playing by the end of the afternoon! The band had a good day out, and enjoyed listening to all the other performances too.